The Land of Enchantment, New Mexico is known for its beautiful and unique landscapes. People from all over come to witness the wonder of the White Sands National Monument, the marvel of the Rio Grande Gorge, the awe-inspiring grandeur of Shiprock, and to explore the depths of Carlsbad Caverns. The largest hot air balloon festival in the world happens here, as well as for the unique southwestern foods. Below we’ll go over the safest cities in the state for those of you looking to move here. We ranked the top 25 safest cities in the state, with one coming out in the top 500 safest cities in the nation. Nearly 10 of the safest cities had a safety score above 70. There is a high unemployment rate in the state, which contributes to the higher crime rates in certain areas. 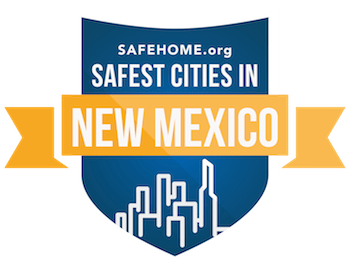 Checking through our rankings will help you find the safest areas to reside in within New Mexico. The safest city is Sunland Park, with a safety rating of 88.21 and a population of 15,700. It has seen a 14.9% reduction in violent crimes, which were already low. It is safe because it is a very family-oriented town, with good public schools and a tight community. Other safe cities tend to be clustered around Albuquerque and Santa Fe, where the majority of jobs are held. There is Corrales (86.46), Lovington (83.16), and Rio Rancho (82.69). The larger cities tend to have lower safety scores due to the much higher population density. Albuquerque has a safety rating of 52.34 while Santa Fe is at 65.25. Not at all bad for such large cities, but as always, the surround suburbs tend to be much safer.